Earlier this month McLaren announced it will soon launch yet another supercar, this time a grand tourer that promises to be the lightest in its class. It will also be McLaren’s "most usable mid-engined car yet.” But what will it be called? McLaren failed to disclose that information to us at an invite-only event at the 2019 Geneva Motor Show earlier this month, but recent rumors suggest it may receive the "GTZ" moniker. A New York-based intellectual property law firm just last week filed the rights to the name "McLaren GTZ” with the United States Patent and Trademark Office for the use of "motor land vehicles, namely automobiles, and structural parts therefor.” Last month, ever so conveniently, a London-based firm also filed "GTZ” with the European Union Intellectual Property Office on behalf of the carmaker. We reached out to McLaren seeking comment and Global Communications Director Wayne Bruce told us the following: "McLaren Automotive periodically applies to register a number of different trademarks to protect our IP today and in the future. But [GTZ] is not the name imagined for the new Grand Tourer. An announcement on that will be made in the coming weeks so you don’t have long to wait." Well, there you have it. GTZ is apparently not the chosen name, at least for this particular model. This luxury grand tourer will also be sold as a separate model outside of the existing Sports, Super and Ultimate Series models, which is kind of an unusual move. Then again, a grand tourer may not exactly be the right fit for any of those series, which all emphasize track and overall high performance. This new supercar will be different. 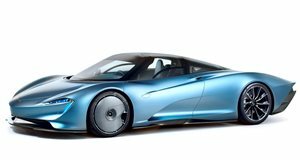 It will also reportedly share some of its DNA with another certain McLaren GT car, the 1,035 hp Speedtail hypercar. What we’re wondering is whether the supercar will also incorporate something else from the Speedtail, though originally made famous by the F1: a central driving position. Given that McLaren aims to position its new GT supercar outside of the regular lineup, having the driver sit front and center could become a signature trait for future McLaren GT luxury supercars and hypercars. Again, this is purely speculation on our part but full details, including confirmation of the officially chosen nameplate, are expected soon.